The most common reasons people don’t exercise are: time, location, money and kids. If you are like me, you find public gyms annoying, distracting and restricting (e.g. bad bars, no heavy dumbbells, TV’s (seriously! ), non-round plates, no banging weights, squat racks turned into curl racks, no chalk, no grunting and no farmer’s walk bars, no specialty bars, no rings or room to sprint, throw a med ball or do loaded carries). Beginners also often mention that they find public gyms intimating. The good news is that all of these problems magically disappear when you train at home – if you get the right stuff and know what you are doing. At first, I was hesitant to answer tackle this as this great question really needs an entire book, not a blog post. Note: I am planning later this year on writing an entire book on how to set-up a home gym and train at home (this topic needs a full book to do it justice). However, I have a soft spot in my heart for home gym training. In my almost 30 years of training, much of it has happened at home. Over the past few months, I’ve been training almost exclusively at home to be with my family. I’m also frustrated when I see so few people taking advantage of home training or making poor equipment choices. Therefore, until I can get that home gym training guide written, here is a post to get you started. 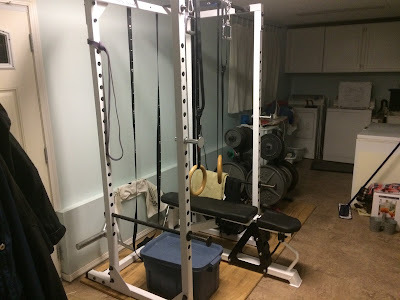 Note: for more on the benefits of why training at home is so great, check out my post: A Case for Home Gym Training. If you haven’t done this yet, stop and really think through what you want out of training. What are your goals? What do you like to do? What do you need to do? What style of training do you prefer? Are you going to be competing in a strength sport (e.g. Powerlifting, Weightlifting, Strongman, Crossfit)? Your answers to these questions should not only dictate your training decisions, but also your equipment purchasing decisions. Some equipment is expensive. In addition, home gym equipment depreciates about as fast as buying a new car. Don’t rush into purchase decisions. If you buy the wrong stuff, you won’t get you the results you deserve. Bad or inappropriate equipment will just take up space until you sell them for WAY less than you paid for. If you have unlimited space and money, then you can ignore this advice. For everyone else, don’t buy things that are only used for one thing (e.g. a chest press machine). You want equipment that can be used for multiple exercises (see below for examples). Again, if you have tons of space and money, a full dumbbell rack is great. However, a pair of adjustable dumbbells, some training knowledge and a large amount of work ethic may be all you need to build your best body (I would also add a pull-up bar). 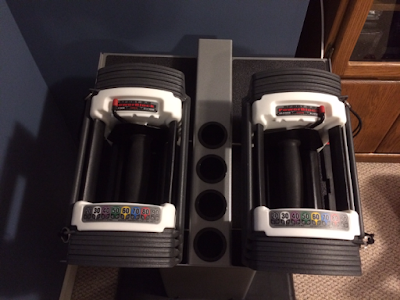 The most economical adjustable dumbbells are the screw-lock handles. The typically cost about $30-35 and then you just load them with standard plates. Also, if you are pressed for space you can store the handles and plates under furniture. 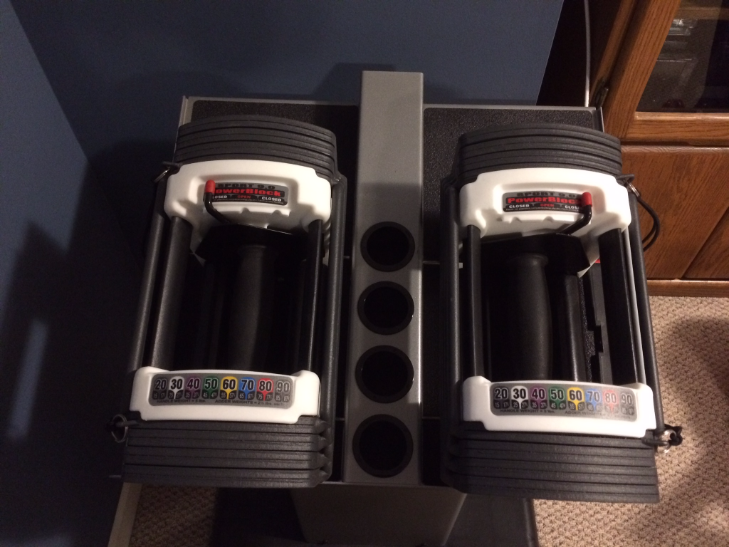 If you have more money, there are fancier dumbbells such as PowerBlocks. These have add-on kits to make them heavier as you get stronger. They are also very fast/easy to adjust. The barbell is one of the best tools to build strength, increase muscle mass, improve performance, burn fat and train in a time-efficient manner. Depending on your goals, level of experience and training style, the barbell may be even more important than dumbbells. The stronger you get, the more important a good, quality Olympic barbell becomes. Please follow Jim Wendler’s sage advice when it comes to barbells: “Buy nice or buy twice!” A good barbell should have a weight limit way more than you ever think you will need. These sleeves should rotate will, not have plastic in them or a big bolt at the end. While there are many good barbells on the market, a great all-around bar for most serious lifters is a Texas Power Bar. 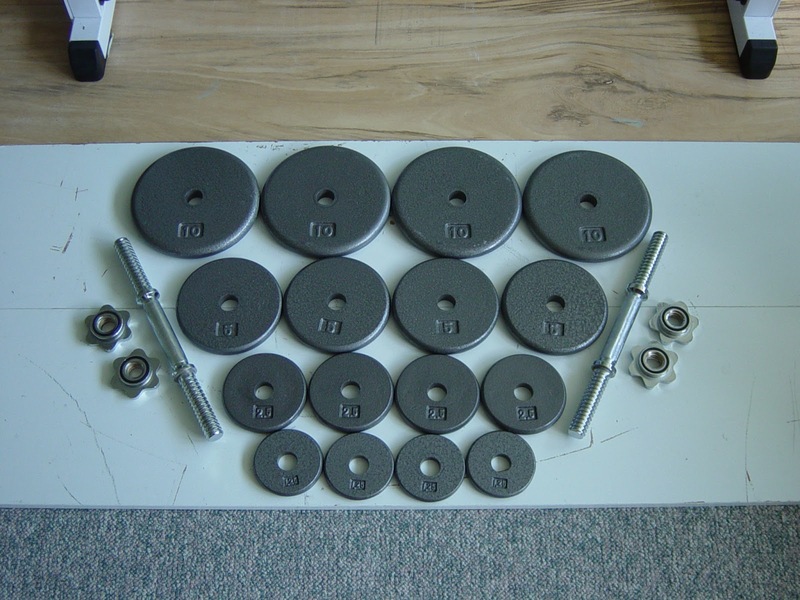 Avoid buying plates online as the cost of shipping heavy boxes weights can often rival the price of the weights. You can get new plates at a local fitness store. However, because plates don’t really wear out, you don’t lose out if you choose to get used plates if you can wait to find the right ones. (Note: check for cracks from dropping and make sure the hole has not expanded over time as this can make the plates noisy and sloppy on the bar). Craig’s list can be a good place to check for used plates. Also, as gyms go out of business all the time, you can also get amazing deals at local auctions. If you are planning to deadlift, make sure you get round plates! Once you have a barbell, adjustable dumbbells and plates, the next best thing you can buy is a power cage. If you are serious about barbell training, this the best piece of equipment you can buy. Power cages allow you to do exercises such as bench presses and squats without a spotter. This is important as bench pressing alone, at home without a spotter is one of the top causes of death related to weight training. 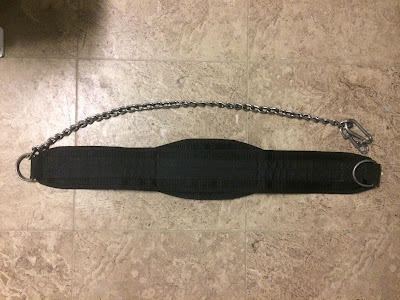 A power cage also gives you a chin-up bar (get one with a multi-grip chin-up bar if possible), a place to hang rings and the option of adding extra attachments down the road (e.g. dip bar, cable). These days more and more people are going to half and open racks – don’t follow them. Half racks are more dangerous if you were to fall back while squatting. They limit certain exercises (e.g. dips) and certain combinations (e.g. squats alternated with pull-ups). Also, they often seem to cost the same amount as a full cage. Why pay the same price for half the rack? Most home gyms will have a weight bench. This is not mandatory as you can press from a standing position or lying on the floor, but it is nice to have if your budget and space allows. A dip belt is a great way to load chin-ups and dips – two of the most amazing upper body exercises you can do! 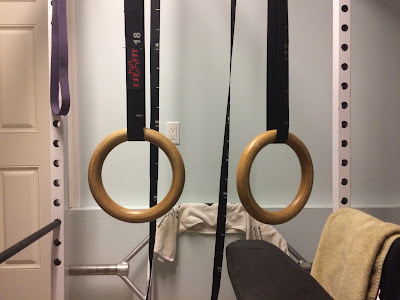 Over the past 5 years or so, the popularity of suspension training has skyrocketed. Like every other useful training tool, they have been around for a long time. Gymnastic rings were first used by German gymnastics coach Adolf Spieß in 1842. Gymnastic rings competition first appeared and Paris Olympic Games in 1924. Gymnastic rings are about half the price of other popular suspension trainers, more versatile and faster/easier to use. I keep mine hanging from my power rack and take them with me when I travel. While there are plenty of inferior suspension training exercises, there are a handful of ones that can be a helpful addition to a barbell/dumbbell program (please see the sample program below for examples). Note: only get ones with wooden handles and number-marked straps! One item missing from most home gyms is a cable stack. Bands can be a fast, simple alternative for some accessory exercises. 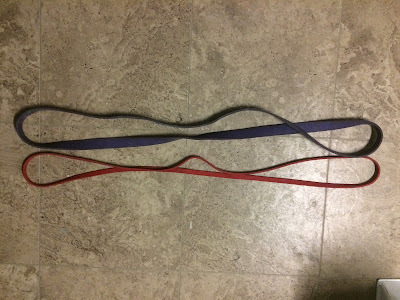 I recommend bands with 2-4 different thicknesses/tension levels. Also, buy them in pairs. Depending on your needs, goals, space, and budget, there are lots more training tools you could get. Examples include farmer’s walk bars, trap bar, safety squat bar, medicine balls, kettlebells, weighted sled, cable stack, etc. However, the above list will give you more than enough tools to build your best body. Now, let’s talk training. Disclaimer: this is just a sample program for educational purposes only. It is not a personalized fitness program. It may not be safe or appropriate for you. Always check with your doctor before starting this or any exercise program. Exercise can be dangerous or deadly. You must assume these risks if you choose to proceed. If you are not familiar with any exercise or want more information on how to do them right, you can find them on my YouTube Channel exercise video library. If you want to train 5x per week and have shorter workouts, you could always take some of the strongman/conditioning work from day 1 or 3 and move it to day 5. Awesome - thank you very much Andrew. This is a great overview, very helpful and will definitely put this in play. Short term will be adding in the adjustable dumbbells. Look forward to your larger piece on this! You are most welcome Cal. I hope you find it helpful - great question! Yes, I will be working on a full book to really dive into this topic in the future. All the best with your home gym training. It is nice to learn about these tips for home gym. I think we can work at vibro shaper for the right ones. Nice body. Thanks for your blog. I recently visit across a fascinating website containing information on treating feline diabetes with natural herbs and supplements with the guidance SYSTEME DELIVRANCE, DESTRUCTEUR DE DIABÈTE, Tout sur les Abdominaux and La Diète 3 semaines. Thanks for sharing. Extremely pleasant article,nice to learn about these tips for home gym , you need to have weight machine too.